The communique of the Global South's Primates Meeting in Kigali is out--and something has actually been done to move us forward in resolving our crisis!! The most important portions of the statment in relation to our present troubles are reproduced below (emphasis added). The Primates have decided that the time for a new orthodox American province has finally arrived!! a. We have asked the Global South Steering Committee to meet with the leadership of the dioceses requesting Alternative Primatial Oversight, in consultation with the Archbishop of Canterbury, the Network and the ‘Windsor Dioceses’, to investigate their appeal in greater detail and to develop a proposal identifying the ways by which the requested Primatial oversight can be adequately provided. b. At the next meeting of the Primates in February 2007 some of us will not be able to recognize Katharine Jefferts Schori as a Primate at the table with us. 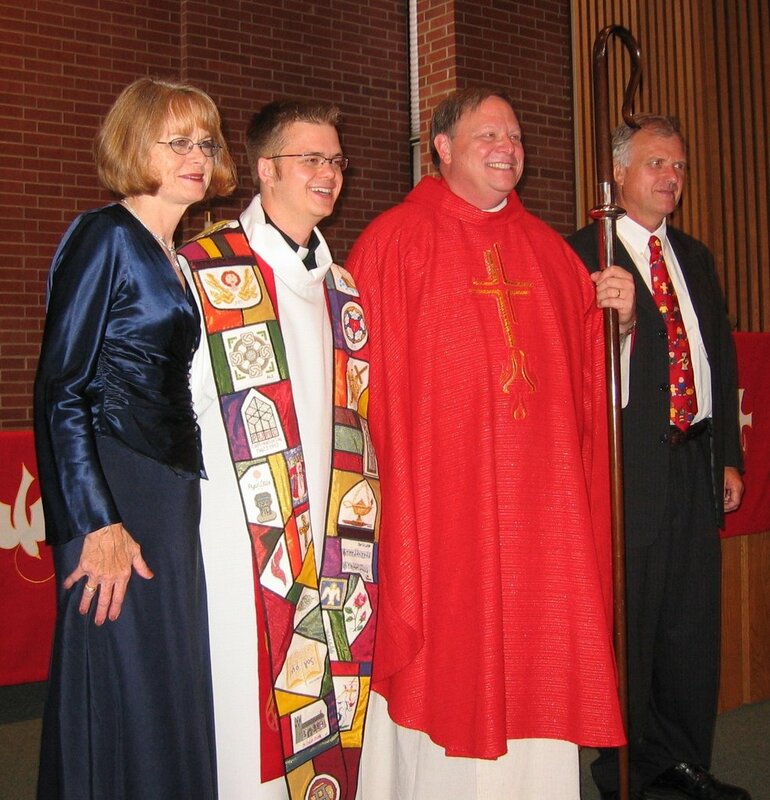 Others will be in impaired communion with her as a representative of The Episcopal Church. Since she cannot represent those dioceses and congregations who are abiding by the teaching of the Communion we propose that another bishop, chosen by these dioceses, be present at the meeting so that we might listen to their voices during our deliberations. c. We are convinced that the time has now come to take initial steps towards the formation of what will be recognized as a separate ecclesiastical structure of the Anglican Communion in the USA. We have asked the Global South Steering Committee to develop such a proposal in consultation with the appropriate instruments of unity of the Communion. We understand the serious implications of this determination. We believe that we would be failing in our apostolic witness if we do not make this provision for those who hold firmly to a commitment to historic Anglican faith. I urge all readers to take the time (25 minutes) and watch AnglicanTV.org's interview with the Moderator of the ACN, the Rt. Rev. Robert Duncan of Pittsburgh. It may be found here. The video provides a fascinating and detailed account of the recent failed "summit" meeting in New York and Bishop Duncan's optimistic outlook for the future. Well, the results I got would certainly cause me to question this survey, but take it nonetheless and see what you think. In response to the Pope's comment that Mohammed's teachings in the Quran have sometimes led people to use violence in the spread of their religion, some Muslims have responded by murdering a nun who worked at a children's hospital. That should convince people that the Pope was mistaken! 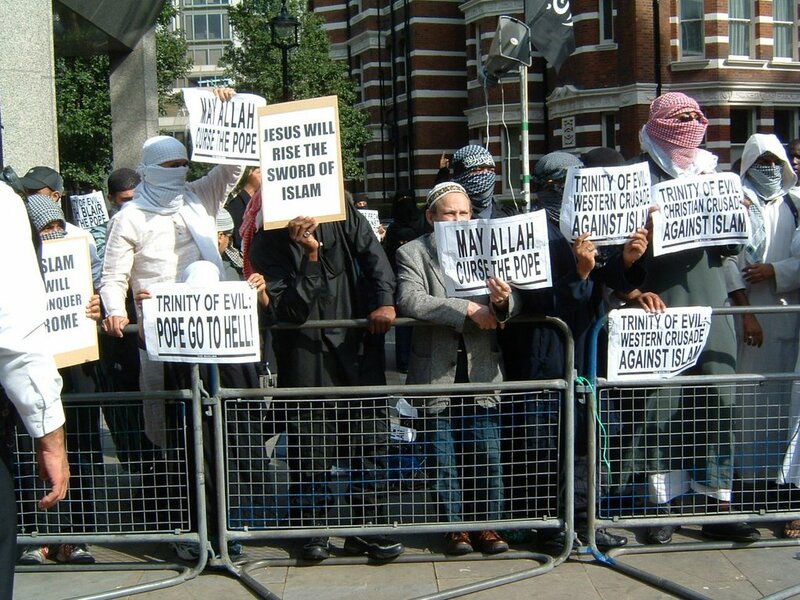 The gentlemen outside the Catholic cathedral of London in the photo above also want to make it clear that Islam is about love and peace (or at least it will be after Allah curses the Pope and sends him to Hell as a result of their prayers!). And after all of the other servants of the "Trinity of Evil" are expunged from the face of the earth, things will undoubtedly be very peaceful indeed. It will not come as a shock to anyone who has seen my picture on this blog that I have a weight problem. Well, I am trying to do something about that. I joined Weight Watchers seven weeks ago today, and it is going very well. Today I reached my first weight loss goal--losing 10% of my initial body weight. To date I have now lost 41 pounds! (Just do the math to find out how much I weighed at the end of July.) It has only taken me seven weeks to reach this first goal. The average WWs member takes 16 weeks to reach 10% weight loss, so I have been fortunate. 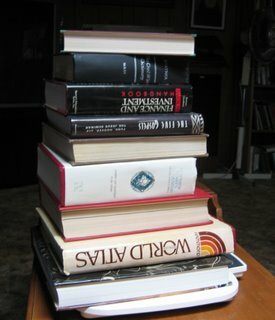 The stack of books above weighs 41 pounds. I cannot believe that less than two months ago I was carrying this much extra weight around with me everywhere that I went, 24 hours a day. 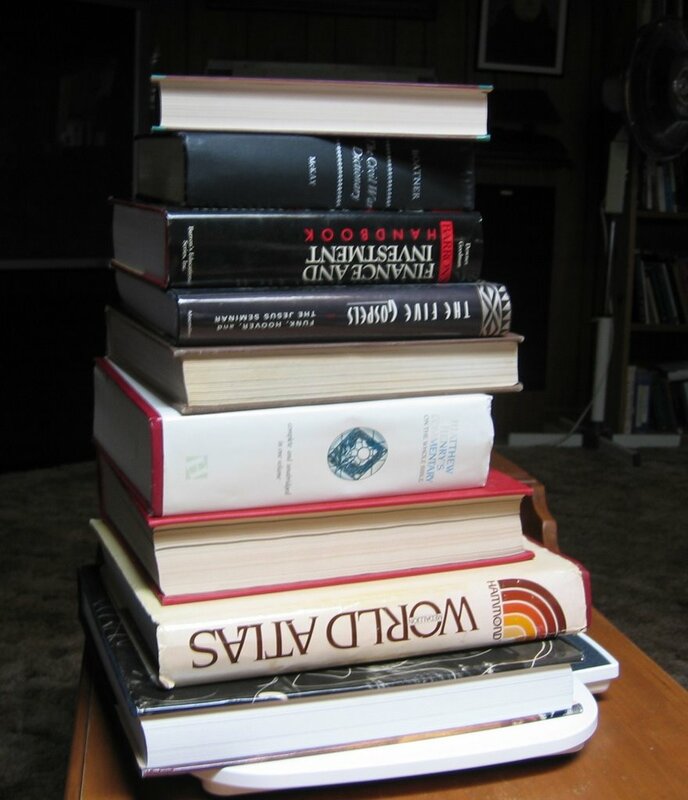 (Just imagine carrying this load of books up a flight of stairs five or six times per day. Boy, no wonder I got winded so easily!) 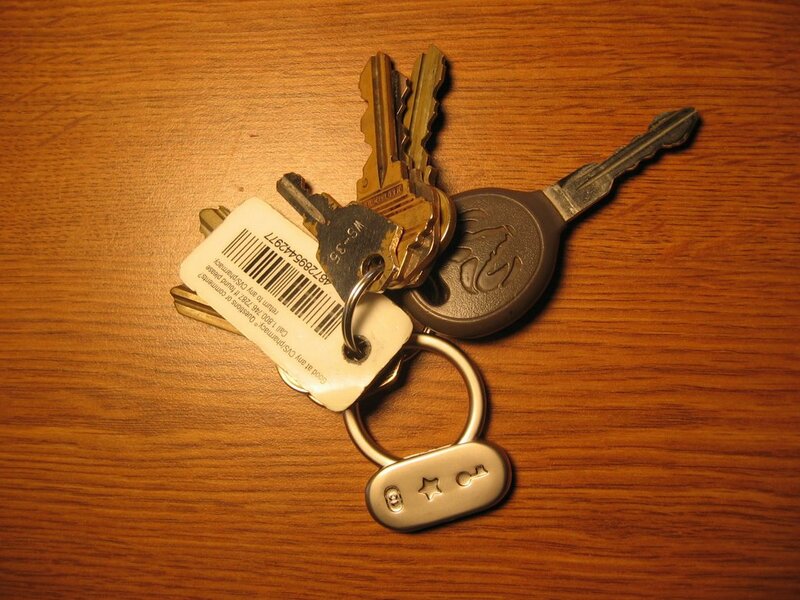 This morning at my meeting I received the handsome pewter "10% keychain" below to commemorate the event. I still have a long way to go until I reach a healthy weight, but I am encouraged so far. Thanks to my friends for their encouragment. This is big! Christ Church, Plano, was until today the largest single parish in the Episcopal Church. No more. Read the story here. Stand Firm has published a statement by the Rt. Rev. Jack Leo Iker, Bishop of Fort Worth, on the meeting that concluded in New York yesterday. A highlight from the statement is found below. ... it is my sense that the time for endless conversations is coming to a close and that the time for action is upon us. I am not interested in having more meetings to plan to have more meetings. Our appeal for Alternative Primatial Oversight is still before the church, and provision must be made for the pastoral need we have expressed. The initial appeal from this diocese was made to the Archbishop of Canterbury, the Primates and the Panel of Reference. (We soon withdrew our request for consideration by the Panel of Reference due to its apparent inability to act on any of the petitions that have been placed before it over the past year or so.) When six other dioceses made very similar appeals, we consolidated them into one joint appeal and submitted it to the Archbishop of Canterbury in late July. 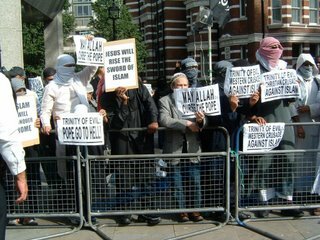 After prayerful consideration and consultation, the Archbishop called for the New York summit, which took place on September 11-13, 2006, in hopes of finding an American church solution to an American church problem, but to no avail. We could not come to a consensus as to how to recognize and respond to the needs expressed in the appeal. So back to Canterbury it goes, as the principal Instrument of Unity in the Anglican Communion, but this time with a renewed emphasis on appealing also to the Primates of the Communion as a whole and not to Canterbury alone. The Primates Meeting is a second, very important Instrument of Unity in the life of worldwide Anglicanism. We ask for their intervention and assistance when they meet in February. Some have balked at the terminology of our appeal requesting Alternative Primatial Oversight, pointing out that the Presiding Bishop of the Episcopal Church does not really have canonical oversight of any of our dioceses in the first place. 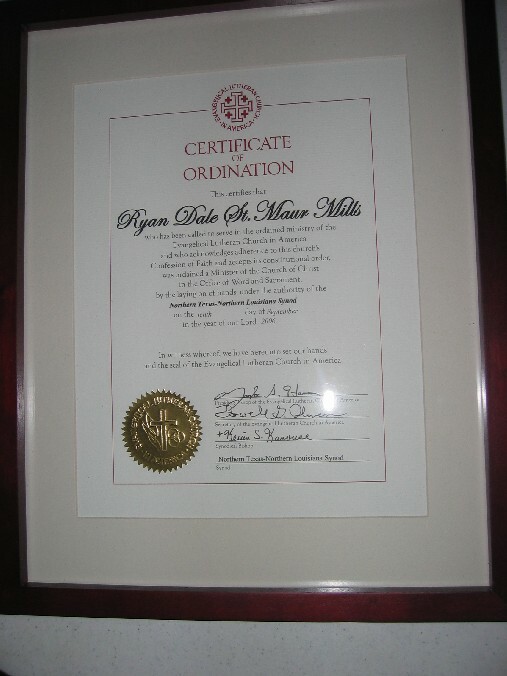 While I can see their point, nonetheless the official job description for the PB is “Chief Pastor and Primate,” and it is this role that we seek to have exercised on our behalf by an orthodox Primate of the Communion, and not just someone other than the Presiding Bishop-elect of ECUSA. We require a Primate who upholds the historic faith and order of the catholic church and is fully compliant with the recommendations of the Windsor Report as the way forward for the Anglican Communion. Only in this way will we have an unclouded primatial relationship with the rest of the Communion. Thank you all who prayed so fervently for us in our deliberations in New York City this past week. I am sincerely grateful for your encouragement and support. Your prayers were indeed answered - and are being answered still, in ways that are yet to be revealed. Please note that a very important gathering of “Windsor Bishops” will be held at Camp Allen in Houston next week, from September 19-22, and that I will be present for those discussions. 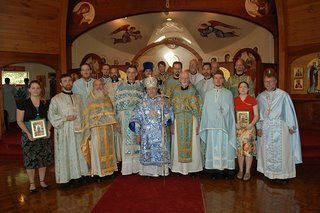 Last Friday another good friend of many readers of this blog was ordained a priest in Christ's one, holy, catholic and apostolic Church by Metropolitan HERMAN of the Orthodox Church of America at St. Vladimir's Theological Seminary in New York. 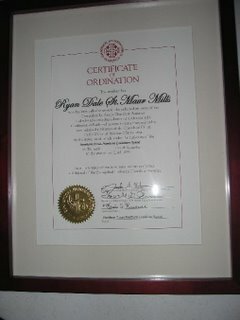 I had very much hoped to attend the ordination service, but unfortunately a brief illness prevented me from doing so. 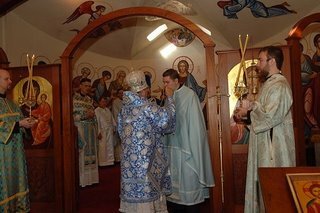 From these photos, it was a magnificent Liturgy. May God bless Father Matthew with many fruitful years of ministry for the Gospel! Thanks be to God! We had honest and frank conversations that confronted the depth of theconflicts that we face. We recognized the need to provide sufficient space, but were unable to come to common agreement on the way forward. We could not come to consensus on a common plan to move forward to meet the needs of the dioceses that issued the appeal for Alternate Primatial Oversight. The level of openness and charity in this conference allow us to pledge to hold one another in prayer and to work together until we have reached the solution God holds out for us. I am not sure what this "working together" between Bishops Iker and Schori might look like in future if the present meeting came to nought, but time will tell I suppose. It looks to me like we are still at square one. The revisionists at national headquarters will not willingly let the orthodox go their own way. Now for the Camp Allen meeting. Readers who have taken an interest in some recent threads on this blog may find the comments of Canon John Heidt, the canon theologian of my diocese, also to be of interest. Read his reflections (originally published in The Living Church) on remaining Anglican at Transfigurations. Ruth Gledhill, religion correspondent of The Times of London, reports that the meeting of the liberal and orthodox American bishops (including my own bishop, the Rt. Rev. Jack Leo Iker of Fort Worth) that began today in New York City may be moving toward a "two church solution." Read her report, speculative though it is, here. Today I taught the fourth class in "Renewed by the Blood of God," my lecture series on the person and work of Christ in the writings of the Fathers of the Church at St. Laurence, Southlake. We covered Gnosticism and St. Irenaeus' response to it. 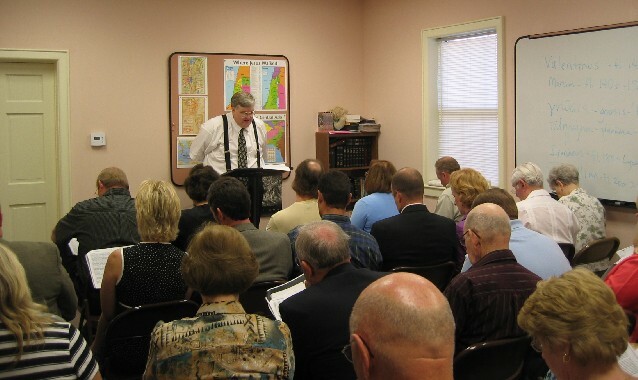 Attendence has been excellent, so much so that it was standing room only! As a result we get "promoted" next week to the parish hall. Thanks to R.D. Foster, my T.A. and the official class photographer. The title, incidentally, is taken from St. Ignatius' Letter to the Ephesians. Many of my Anglo-Catholic friends are what are commonly called "Anglo-Papalists," and they are quite eager for reunion with Rome as swiftly as possible. I am afraid that I am not cut from that cloth. While I too yearn for the day when we all will be one, as Christ and the Father are one, and I believe that the Roman see should hold a "primacy of honor" on that glorious day, I cannot now in good conscience submit to the Roman Pontiff as holding supreme jurisdiction over the entire Catholic Church (at least not in the form they presently claim to be able to exercise that jurisdiction) or as being able to pronounce infallibly on matters of faith or morals without the judgment of an ecumenical Council. I have had my differences with Fr. Hopko on theological issues in the past, but I recommend this short essay highly.